Looking for a heavy duty roto-molded cooler for your upcoming outdoor trip? No matter where you are going to spend your vacation, you must be needed a sturdy cooler to keep your things cold during the whole trip. That’s why you need the best quality cooler. When it comes to picking the best cooler, YETI is always a great option for almost all kinds of adventure trip. In this article, we will try to help you find the best YETI cooler for your upcoming camping trip. Before going to the top rated yeti coolers list let me clear you one thing. 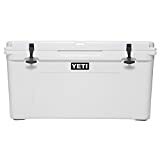 YETI is a premium brand and the most popular brand of coolers and outdoor gears. The products from YETI comes at a premium price. So, if you are looking for an inexpensive cooler, these coolers might not be suitable for you. If you are looking for a portable and soft-sided personal cooler, the Hopper TWO can be a great option for you. This cooler is made for those kinds of outdoor adventures where you just need to grab your favorite gear and go. It is a 100% leak-proof cooler which can easily hold ice for days. The materials used in making this cooler are the same used in whitewater rafts. The high-density fabric that is used to make this cooler is fully waterproof and mildew resistant. Therefore, the liner is built from FDA approved food grade materials. YETI uses closed-cell rubber foam which ensures superior ice retention. The HydroLock zipper is very tough and completely leak-proof. For comfortable carry, the cooler has adjustable straps. The straps are simply indestructible and ready to last long for a long time even a lot of abuse. Luckily this cooler has a hitch point grid which allows you to add additional elements like a bottle opener. The cooler comes with three different sizes to choose from. You can pick small Hopper 20, medium Hopper 30 or even large Hopper 40 cooler. Each of the sizes comes with two different colors. 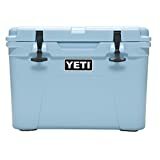 YETI is providing 3 years warranty on their Hopper series cooler. People who need a portable soft-sided cooler for their regular use, this can be a perfect option for them. The Roadie 20 is a portable hard cooler by YETI. It is the smallest version of hard cooler manufactured by YETI. If you need an extremely durable small size cooler that can be transported easily on any outdoor trip, then you should consider the Roadie 20 above other brands. There’s a lot of reasons for why this cooler comes above the competition, especially for small size cooler. First of all, the Roadie comes with the same high-quality materials used in YETI’s Tundra series cooler. The roto-molded construction makes this cooler indestructible so that you can use it almost any outdoor trip. The cooler can keep your things cold for days and it has been tested and proven by the experts. Like most other coolers, this one is certified bear resistant. Roadie features T-Rex Lid Latches which is constructed of heavy-duty rubber. This will prevent any kind of busted latch. The Roadie dimensions are 19 x 14 x 15 with an empty weight of 16 lbs. The cooler can hold up to 14 cans with a 2:1 recommended ice-to-contents ratio. Since the cooler is very small, anyone can carry it easily even when it fully loaded. This cooler features all of the same qualities that other YETI cooler has. This is small and portable enough to be taken on anywhere. The only thing you may not like is the price. Like other YETI products, this one is expensive. But the quality and features definitely worth the price. YETI has made some fantastic cooler in their Tundra series. The Tundra 35 is the smallest portable cooler that is made for serious camper. This small size cooler is portable enough to be carried by individuals in their outdoor trip. Like other YETI coolers, the Tundra 35 come with rationally molded construction. It makes the entire cooler virtually indestructible and ready to be a part of your regular adventure trip. With the impressive ice retention capacity, this cooler can accommodate 20 cans of your favorite beverage at a 2:1 ice-to-content ratio. The extra thick fat-wall design is certified bear resistant. This is another important thing you need especially for camping on the bear area. From several user’s ice retention test, we found that this cooler can hold ice for 4-5 days. There are nylon rope handles on both sides of the cooler to make it easy for carrying during your trip. You are free to choose any color among 5 different colors. Therefore, a 5-year warranty is another great thing that you must like about this cooler. This cooler is made for the people who love camping and doesn’t want to invest in coolers every time. Along with the best quality materials and premium features, it comes with a high price tag. But if you consider the longtime service, this cooler really worth the price. YETI Tundra 45 quart is a perfect size cooler for any family outing. 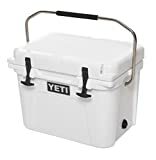 This is the most selling cooler in YETI’s Tundra product line. The Tundra 45 is a medium sized cooler but you can handle it easily even when it fully loaded. This cooler is large enough to store a lot of foods and drinks during your trip. This cooler can hold up to 26 cans at a 2:1 ice-to-content ratio or 35 pounds of ice. It comes with an extra thick FatWall design and 3 inches of PermaFrost Insulation which ensures the longest ice retention. The cooler can hold ice for around 4-5 days even in hot weather. So, it’s fairly good insulation for a hard cooler. YETI coolers are extremely durable. They use the best quality materials to ensure the sturdy construction. There are four different colors available for this cooler. And YETI is giving you a free dry food basket with this cooler. If you are searching a robust cooler for your regular family outing, this one is undoubtedly the best option. You will like everything on this cooler except the price. But since this is a premium brand cooler and will give you the best service, the price can be considered. If you need a large cooler for your friends and family trip, Tundra 75 would be a great option for you. This cooler is ideal for keeping your friends and family fed and hydrated during a long trip. It comes with a capacity of 50 cans with 2:1 ice-to-contents ratio. The dimensions are 33.2 x 18 x 18 with an empty weight of 30 lbs. YETI coolers are good enough to keep things cold for a longer time. The Tundra 75 can keep your drinks cold for up to 72 hours and beyond. Since the cooler is large, you have to pack it carefully and fill the entire cooler with foods, drinks, and ice properly. This will give you the maximum ice retention. The heavy-duty construction makes this cooler indestructible. So you can take it anywhere you want. Since this is a large cooler, you can’t carry it by yourself. It needs 2 people to carry. 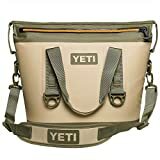 YETI includes military-grade polyester rope handle which will help you carry this cooler easily. Like other Tundra coolers, this one comes with 5 years warranty which is great. A dry food basket is also included to separate your dry items inside the cooler. Overall, this cooler is great for the large family trip. YETI manufactured a wide range of coolers for almost all kinds of customers. If you are looking for an extremely durable roto-molded cooler, there is simply no good alternative to YETI. 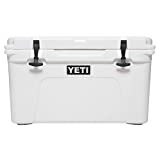 YETI cooler comes with almost all the great features like – good ice retention capacity, easy carrying option, bear-proof and varieties of size and color options. If you don’t want to buy cooler frequently I must suggest you pick a heavy duty cooler from YETI. Just check the best yeti coolers and pick the right size for your need. You must love these cooler once you have one.